Which is best for reaching your website’s mobile users? With the large increase of mobile device users, having mobile friendly access for your website can be a huge asset to any business. There are three main approaches to providing information and interaction to mobile device users: Responsive (and adaptive) website design, mobile websites, and mobile apps. Which option is best for your business will depend on your goals, your users’ habits, and of course, your budget. A responsive website lets us adjust the view of the site to reflect the browser window width of each user’s device. All the web page elements flow to properly display within the browser width. This is an “all-in-one” solution that Emerge2 has been implementing on its new sites since the summer of 2013. With a responsive site, there is no need for a mobile version or a mobile app, because the same content that is viewed on a desktop also flows to fit within a smaller display. Like a liquid filling a glass, the content of your site will scale down and flow to fit the mobile device’s width. A responsive site is the most cost effective solution as it can be viewed in a wide variety of platforms and devices, such as a tablet or smartphone. 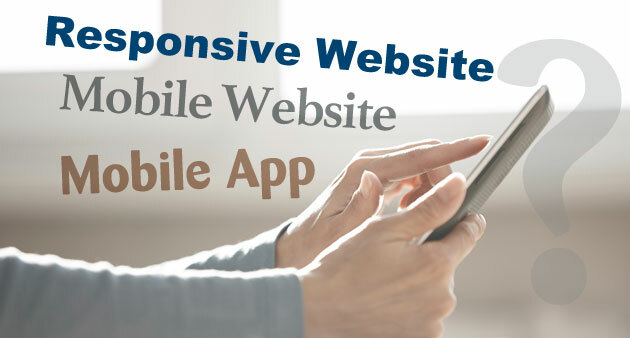 A mobile website is a separate version of your desktop website, created specifically for mobile devices. It will have its own images, code and style, created specifically for a small viewing environment. A mobile website and a responsive site often share the same benefits with the only difference being that a mobile website can only be viewed on a mobile device. A mobile website is an added cost to any existing website since it is a separate website, to target specific mobile devices. A mobile app is downloaded to each of the users’ mobile devices. The app can often do things that a website can’t do such as access the device calendars, compass, accelerometer, camera, etc. The main goal of an app is to show/use productivity tools and create a high level of personal interactivity with the user. Out of the three options we have discussed, the mobile app is the highest on cost because it requires a different set of language skills. Developing and testing multiple apps for 100 or more mobile device scenarios and Operating System versions would add many times the expense versus building a browser-based application. A recent poll of the top 78 Alexa ranked websites showed that 88.5% are already using responsive design. This number will only continue to grow as mobile device demand continues to rapidly grow. Having a desktop website is a must in this day and age, but a responsive site, mobile site, or an app are all different marketing channels, all extremely beneficial to any business. It is up to you to decide where to focus your development budget, but recently most people have been creating responsive websites. To read more on this topic, a good article by Daniel P. Dern of ITworld.com can be found by clicking here. Emerge2 can help create the right mobile marketing channel for you. If you need more information or would like to get started with a mobile solution for you business, contact us today.